I am making some progress. It’s not perfect… I’ve made more than a few mistakes but I’m pretty happy with it. I just LOVE the colors I’m working with now. Right now I have a blanket for the baby currently growing in my womb. He is due to arrive in about 9-10 weeks, so I need to get busy. It’s just going to be a small one to cover his carseat, or to eventually be carried around by him. My toddler has one that I made for him, and he likes to cover his head with it to hide. I love seeing him enjoy something that I made especially for him. 9-10 weeks is way more time than anyone should need to complete such a small project, but with a less than 2 year old, an 11 year old, a full time job and a ton of animals to care for I am concerned. I am not much of a knitter, but I try. I am just doing a simple stitch, no pattern, no frills. I am sure he will appreciate it no matter how simple it is. 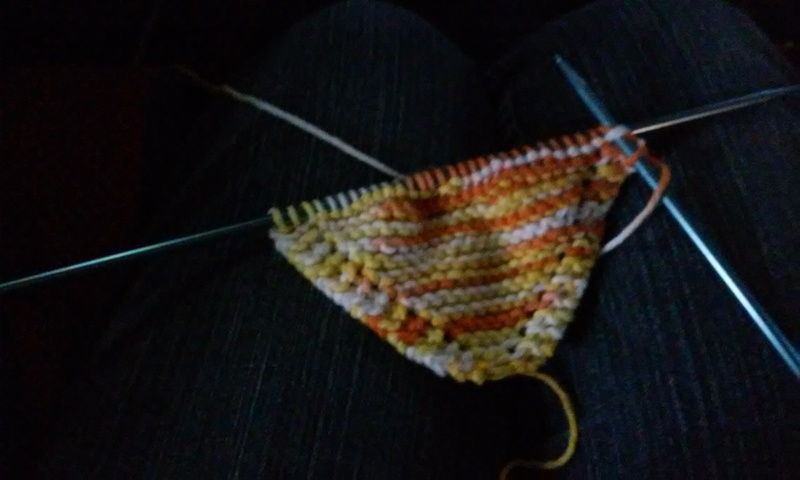 My husband has been doing some research and started a blog that I will no doubt be sharing with you when he finishes, my son has been building a musical video game level on his favorite game, and I have been working on some knitting. 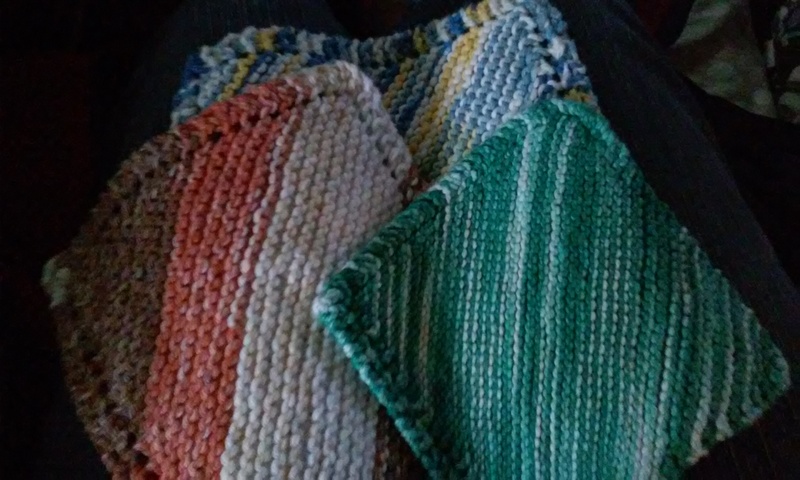 I have been working on a new blanket for my baby boy, He really likes the one he has, so I decided to make him another one in a different color, and bigger to fit his growing body. He is now 14 months old, which is still so crazy to me. 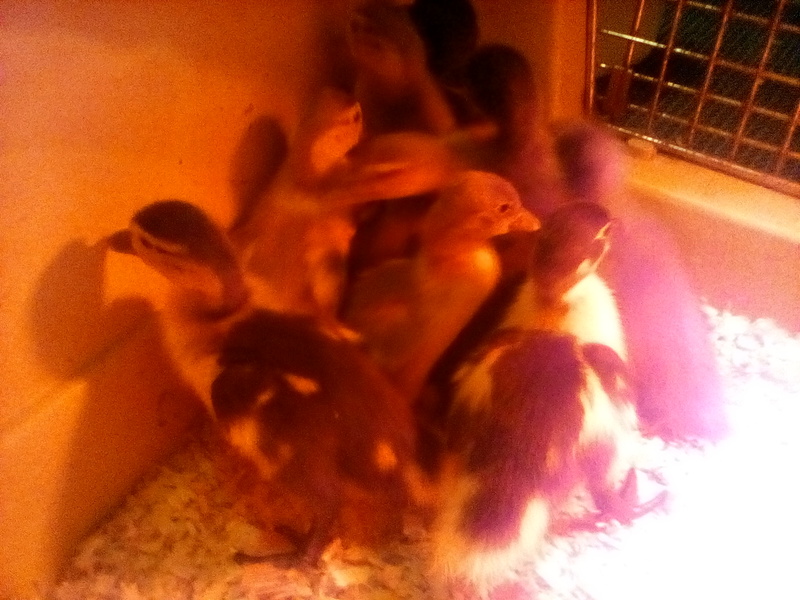 Here is a picture of what I have been working on. This is my first “real” knitting project I have attempted. I have made some hats with my round looms, but this is my first time using actual knitting needles. 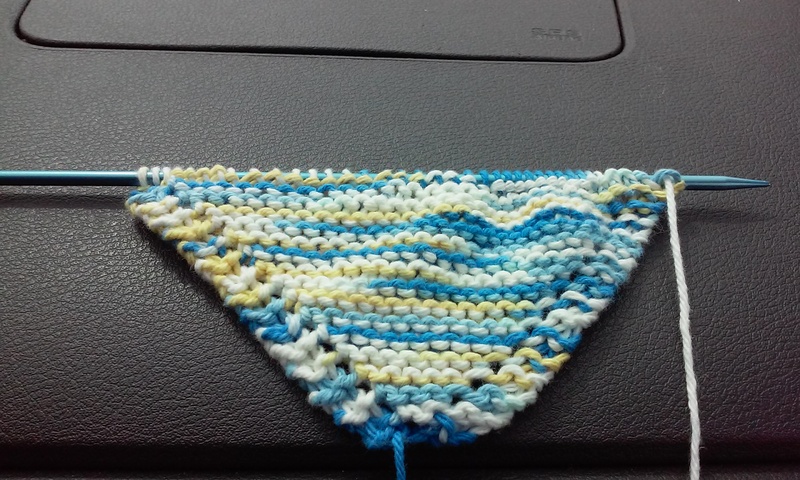 I guess that’s not true, I did attempt to make a dishcloth a while back. It didn’t turn out quite right…so therefore it doesn’t count. LOL! I have just run out of this yarn, so I am going to continue with a solid dark blue. I hope it doesn’t look too weird when it’s finished. I know the baby won’t care. I have made some mistakes, but I think it will still serve its purpose when it’s done. I find knitting so much easier than crochet. I think that this blanket will look a lot neater than the ones I have crocheted in the past. 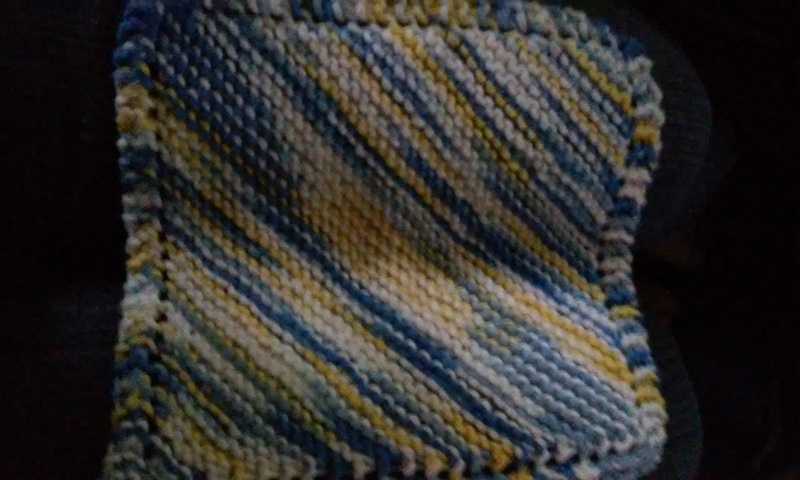 I have never been good about counting stitches, or following patterns, so my crocheted items have always looked a bit funky. 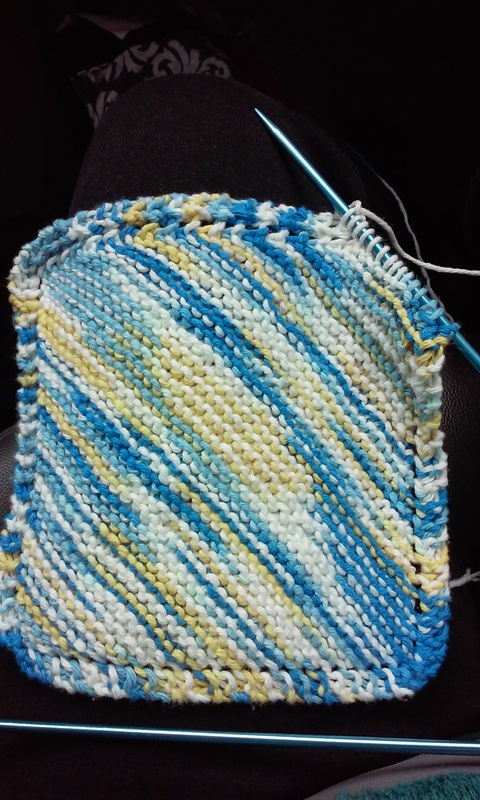 I think knitting will give me a blanket with a better shape…as long as I don’t drop too many stitches along the way. I just wanted to share my progress, and let you know that another good read from my husband should be on the way. This isn’t a spiritual post, just a post to share some deals that my husband and I found. 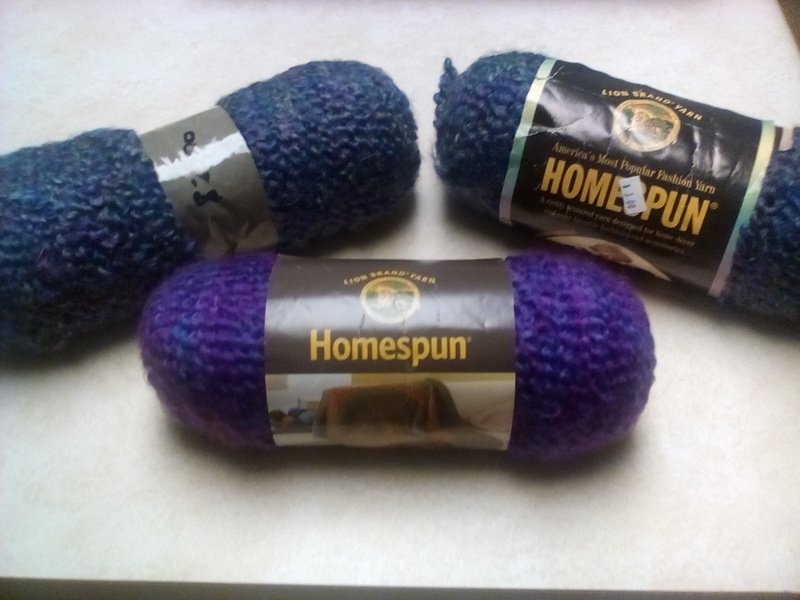 I came home from work the other day to find that my husband picked out some pretty yarn for me at the thrift store. He found 3 skeins of brand new yarn. 2 still had the paper sleeves. He spent $6. Not a steal, but still a very good price for the type of yarn. There was a yard sale advertised right down the street from me. The house is very large, and was recently sold, so I assumed it was the family moving out getting rid of stuff they didn’t want to haul away. I was wrong. It was actually the new owners having the sale. I am still not sure if it was stuff they had, or stuff that was left behind, but that doesn’t really matter. I was able to find some crafting supplies pretty cheap. I hate to spend money, but I didn’t want to pass up the deals. 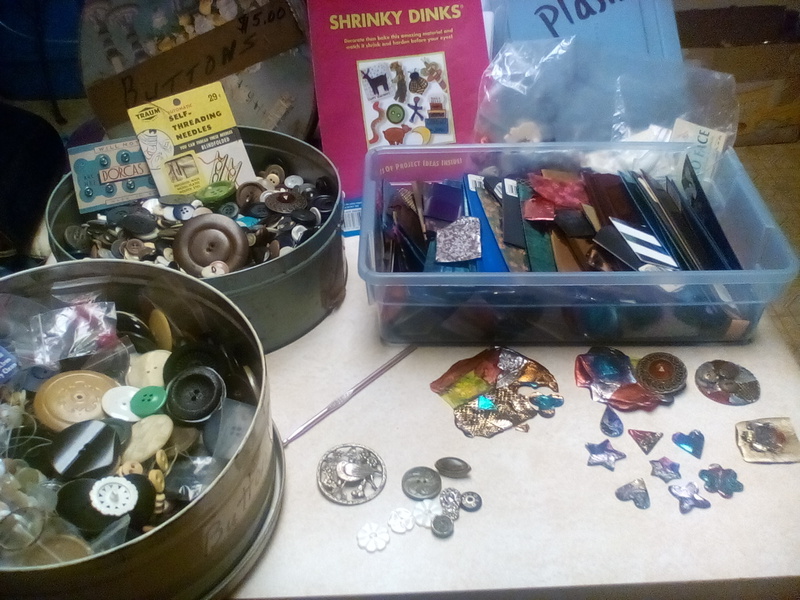 I found 2 large tins of buttons that were $5 each. I know buttons can be pricey, so I snatched them both up. I figured that finding even a few that I loved would be worth the $10. I also found a small box labeled Friendly Plastic for $3. I opened it to take a peek, and saw a ton of plastic strips. I knew they were old, but I figured the box was well worth the $3. I paid for my items, while my son was still browsing. He found himself a brand new plastic boomerang for 50 cents. While he was still looking around the woman selling asked if I knew what Friendly Plastic was, and I said I thought it was for jewelry making, and she said it was and told me a bit about how they had used it, and the water method to heat it. Then she asked if I had seen the Shrinky Dink package she had for sale. I hadn’t seen it, but since I have been trying to find some to use with my son I took that too. It was a pack she had found at a yard sale for $2, with 1 sheet used out of the original 12. She sold me the pack for $1. As soon as we got home I sat right on my porch digging through the button tins while my son tried his new boomerang. He had some luck with it, and enjoyed using it. I found a bunch of buttons that I really like, and some that I think would be perfect to add to scarves or other yarn projects that I make. I also discovered a crochet hook in one of the tins, and a couple of other non-button items that will be useful for crafting. My next finds were at a thrift store, where I was rummaging through the craft supplies. I was looking for some knitting needles, and I was able to find some. :) I don’t know how to knit yet, but I figured getting the needles cheap would be the best way to get started. I found a small pair of circular needles(size 8, 29 inch), and a 4 pack of small double point needles(size 8, 7 inch). I saw 2 other needles that were longer, but I couldn’t find the match for either of them in the bins. 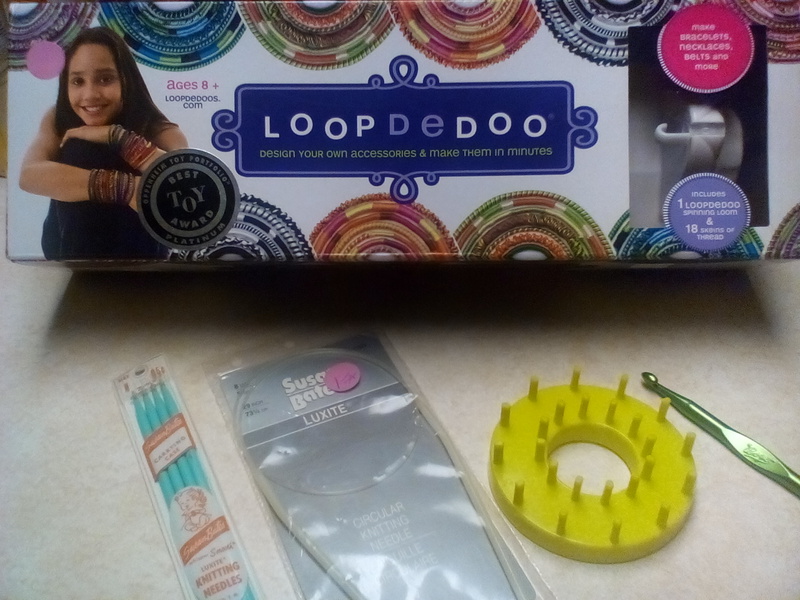 😦 I did find a crochet hook, a flower loom, and a Loopdedoo spinning loom with thread. I paid $3 for all of it! The flower loom ended up being a vintage one from the 1970’s I think. I was looking it up online to see if there were instructions or videos on how to use it. I hadn’t seen a flower loom with 2 rows of pegs before. The loom was marked as a Studio Twelve Flower Loom, which is how I was able to find it was vintage. 🙂 I am excited to start using these items, even though it has taken me a week to get this blog finished. Finding time to do it might be difficult. Hopefully I will find time to do some crafting, but more importantly I want to get into my Bible, and work on learning more about God’s plan for me and my family. I have prayed that I will have an opportunity during this vacation to be a light for God and draw people to Him through my interactions with the people I meet on our travels this week. This should be an every day prayer, but I admit that I still get caught up in just trying to get through my day for me and my needs. 😦 I am a work in progress.